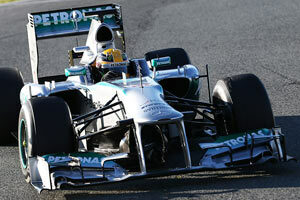 The Mercedes AMG F1W04 is again the product of two different groups of people. The chassis department located at Brackley, UK provides the car's design and the aerodynamic development. Mercedes AMG High Performance Powertrains meanwhile is located in Brixworth, UK and takes care of the engine, along with the KERS package. The latter company is managed by Andy Cowell and is also the supplier of the powertrains to McLaren and Sahara Force India F1. The F1W04 was officially launched early in the afternoon on 4 February at Jerez, but a few hours before the car already debuted in the hands of Nico Rosberg by completing a lap at the circuit. Lewis Hamilton did a few more laps after the launch as well, before kicking off pre-season testing the next day. Mercedes' 2013 car appears much simpler to the eye than its predecessor as the team attempted to shed drag by removed some of the unconventional appendages on the car. Contrary to previous years, the approach was to start with a good baseline before adding further aerodynamic improvements. Team principal Ross Brawn mentioned at the launch that its seeming simplicity was insignificant however as the team has hit its targets of improving the car's overall aerodynamic efficiency. Read more in the full technical analysis. Unfortunately for the team though, its testing debut didn't go particularly as expected. On the first day of winter testing at Jerez, Nico Rosberg only completed 11 laps due to an electrical issue on the car, while the next day Lewis Hamilton ended up crashing the car after 14 laps due to a right rear brake failure.